Than Merrill, CEO of FortuneBuilders, Inc., was chosen as a finalist in The San Diego Business Journal’s 6th Annual Most Admired CEO Awards. The San Diego Business Journal (SDBJ) hosted the 6th Annual Most Admired CEO Awards on Thursday evening. The awards ceremony was held at the Paradise Point Resort and Spa in San Diego. The awards recognize local industry leaders and their achievements within their company and the community. An independent panel of judges evaluates local CEOs based on their leadership, innovation and overall contributions to the community. FortuneBuilders’ CEO, Than Merrill, was among the select list of honorees for the SDBJ Most Admired CEOs. Merrill was nominated for his leadership and efforts toward continued innovation in FortuneBuilders’ premier real estate investment education. 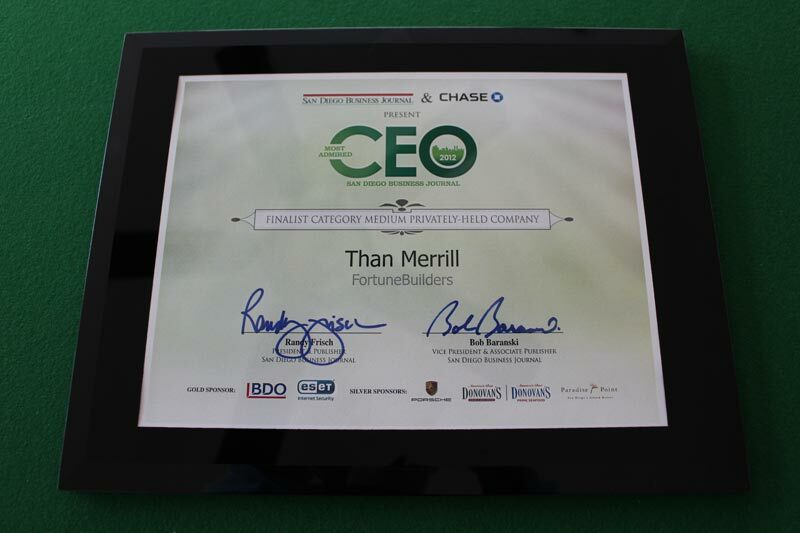 As a 2012 finalist, Than Merrill joins top CEOs from all across San Diego and from every industry. Honorees represented all aspects of local San Diego businesses including service organizations, hospitals, financial institutions, tech companies and non-profits. The Most Admired CEO Award takes a unique approach by recognizing leaders for more than just the success of their company. The SDBJ also evaluates nominees by the impact they have on their employees and the community. This includes the contribute to the innovation of the company, how they empower and inspire others and their involvement in San Diego and philanthropic efforts.